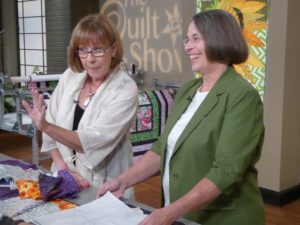 Airing March 12: The Quilt Show! I was honored this August to do a taping with Alex Anderson and Ricky Tims for their webcast “The Quilt Show”. In case you haven’t heard, “The Quilt Show” is a premier web-based broadcast that focuses on one of the most popular and enduring of American crafts — quilting. In 2007, Ricky joined Alex in creating a TV quality program featuring quilters from around the world. Thrilled to be invited, I packed up my quilts and headed to Denver. Its great fun sharing my adventures in quilting to those who also love quilts. In the show, I first talk about one of my early quilts inspired by traditional Amish styles, then share my love of piecing and how I came to work on pieced pictorial quilts. 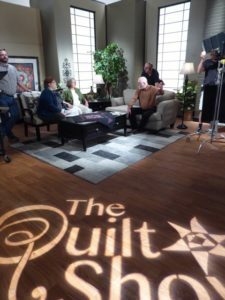 The Quilt Show is filmed in a professional studio located in the suburbs of Denver. My quilts were carefully hung on the walls, and lit with lots of bright lights specially arranged to showcase quilts. My quilts have never looked so good!! 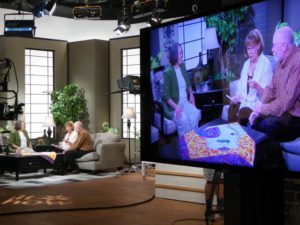 The program was filmed in several segments, each focusing on a different aspect of my quilting and my quilt patterns. In addition to showcasing my work, I had the opportunity to discuss the concept of Gesture that I’ve introduced as an important part of designing pieced pictorial quilts. The live audience also made the process of filming a great deal of fun. Some of the quilters who attended made special vacation plans just to be there for the taping. Their enthusiasm was great! I had a chance to chat with the audience and answered many questions about my style of quilting and the workshops I offer. Thank you Alex and Ricky for a wonderful experience! And a special thanks to everyone on the TQS team who worked so hard on this webcast. 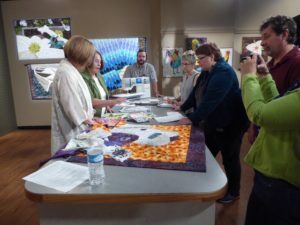 This episode of The Quilt Shop airs March 12! You can view the episode for free when its first broadcast! I also encourage you to browse The Quilt Show website, the range of shows featuring many well known and accomplished quilters is amazing! All the earlier episodes , tutorials, the newest in notions and other features are available for a very reasonable yearly subscription. I signed up for the shows and great tutorials! !